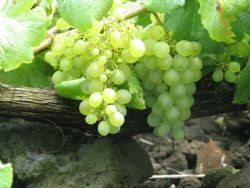 Verdelho is a white-grape-vine, traditionally used in Madeira wine production, which grows well in the Granite Belt region of the Australian state of Queensland, where it usually originate dry white wines. However, little is known on aroma and sensory features of these wines. In this work, a complete volatile characterisation of Verdelho wines from the 2012 vintage produced in the Granite Belt region was carried out. Volatile compounds were isolated by Solid Phase Extraction (SPE), and identified and quantified using Gas Chromatography-Mass Spectrometry analysis (GC-MS), together with a corresponding sensory characterisation by means of descriptive analysis. The chemical compounds that mostly contributed to the flavour of these Verdelho wines were related to fruity sweet notes (ethyl esters and acetates), grass notes (3-hexenol), and floral aromas (2- phenylethanol and β-linalool). Overally all the Verdelho wines analysed were characterised by fruity aroma attributes, especially of “tree-fruit” and “rockmelon”, together with “herbaceous”, even if some significant differences in the other sensory attributes were found between samples.